Preparation time: 15 minutes. Chilling time: 1 hour. Standing time: 30 minutes. Combine raspberries and vinegar in a bowl and let soak for 30 minutes. Place a fine wire-mesh strainer over a second bowl, and pour raspberries and vinegar through strainer. 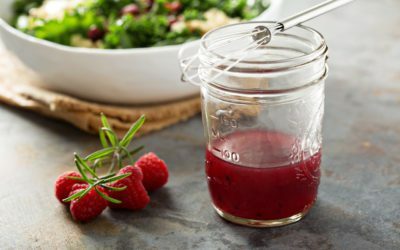 Use a large spoon to force raspberry juice through the strainer. (If seeds pass through the strainer, rinse it, line it with a double layer of clean cheesecloth, and re-strain vinegar.) Yield is one cup. One-quarter cup will be used in the following recipe. Remainder should be tightly covered and refrigerated for future use. In a small bowl, whisk together raspberry vinegar, garlic, onion, rosemary, salt, and pepper. Slowly whisk in olive oil. Best if refrigerated at least 1 hour to allow flavors to blend. Exchanges per serving: 2 fat.